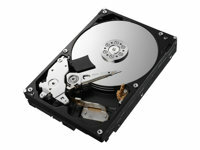 Toshiba’s P300 3.5” internal hard drive delivers a high performance for professionals. With its dual-stage actuator, you can count on smooth, responsive computing. What's more, your data and media is secured with a ramp loading design that prevents damage on the move, as well as a shock sensor. The P300 is available in capacities up to 3 TB.